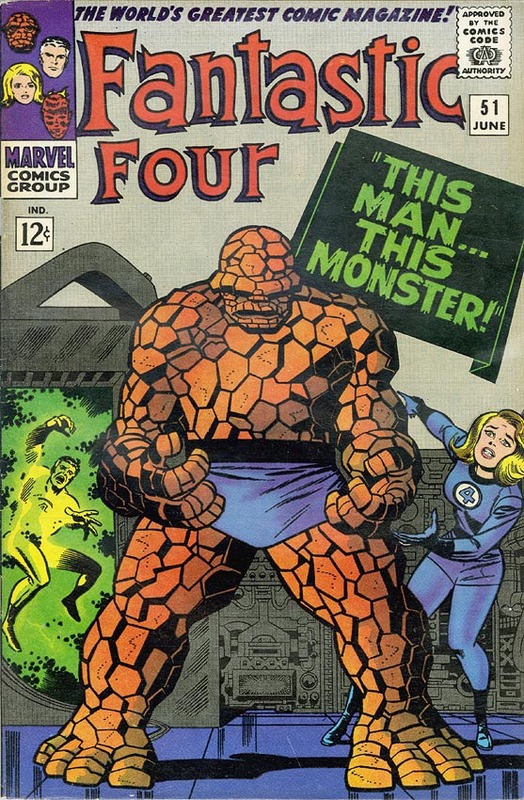 Fantastic Four #51 is often cited as one Stan and Jack's best issues. The story is a rather quiet one, coming right on the heels of the Galactus Trilogy, and is used to make a powerful statement about strength of characters and heroism generally and Ben Grimm's in particular. Not a personal favorite of mine, but I can totally see why so many people like it. NEXT ISH: Featuring the Thing, more dramatic, more heroic, more exciting than ever before! We hate to keep telling that each ish is better than the last, but honest to Gorgon, we mean it! F.F. #51 has everything! It present Reed's latest nutty, death-defying scientific miracle -- it brings you a new and completely different arch-villain -- it gives you more of the goofy goings-on at Metro College -- but, most important of all, it proves once again that bashful Benjamin is the greatest single comic strip character ever created! (With apologies to Irving Forbush!) So, don't even consider missing FANTASTIC FOUR #51 -- it's what's happening, tiger! Not surprisingly, there's a lot of Stan's typical hyperbole. What's strange to me, in retrospect, is that he clearly knew what the story was when he wrote this (Some of his next issue blurbs are pretty generic and still don't match what actually happens in the issue!) but he still tries selling it like there's lots of laughs where there clearly aren't. That "nutty death-defying scientific miracle" really does put Reed closer to death than readers had ever seen him before. Very powerful and dramatic scenes. I'm not sure "nutty" would be an appropriate adjective there. I have no idea what "goofy goings-on" he might be referring to either. Wyatt declines an invitation to join the football team, but that's about it. He could have tried selling the dramatic angle more, and still conveyed that Stan-style bombastic fervor he cultivated. In fact, just eliminating or changing a couple of adjectives, and it would've side-stepped the whole nutty/goofy thing. This is the type of thing I love about older comics -- just trying to figure out what the hell people were thinking at the time! I mean, really, what was Stan thinking? As regards "Reed's latest nutty, death-defying scientific miracle," have you really looked at the radical cube? :-) It looks like at least a dozen inventions that the Thing, certainly, would have called "nutty contraptions" or something to that effect, all at once. As regards "goofy goings-on," the college scenes are a bit of a condensed mixture of juvenile horseplay and (melo)dramatic tension. As I recall, the only time that any of the FF really overtly uses his/her powers in the entire issue is when the Torch lights up his thumb as a smart-aleck joke, after which he promptly gets a glass of water poured on him. There surely must be elements of "goofy," here, at least. Stan was probably trying to ratchet up the "excitement" quotient on a rather atypical (for Kirby) issue of The FF in which there isn't a big battle and the adventure is one of pure discovery. This issue sets up what I think of as "The Lost FF Story." It's actually a very intriguing thing, the whole bit about Johnny Storm having to deal with being an "ordinary" college student coming from a background in which he is anything but ordinary, and the stuck-up quarterback character feeling threatened by having both a super-hero and an INDIAN who is clearly a superior athlete and a better person on campus. (You couldn't do a character named WHITEY Mullins today!) And also the angle about the Coach, who was once "compared to Knute Rockne," wanting to have one last winning season before he retires and being desperate to get Wyatt Wingfoot (who was inspired by the Indian Olympic Decathlete, Jim Thorpe) on board. Too bad it was all overshadowed by the much bigger stories in the world of the Fantastic Four. Johnny never would finish college and these stories were never to be played out. I've always assumed that his time with the FF caused Wyatt to broaden his horizons a bit, as we see him actually on the football team (with no Whitey in sight--what happened to him?) in issue 61. But that was a one-panel payoff without a story! I remember in this ish, how sad and dejected the Thing was...in one scene, he is ruminating, deeply, and they have drawn him with his usual protruding eyebrows of living stone but water....rain...is dripping, pouring off of these brows like water pouring from the broken gutters of an abandoned and dilapidated building...OMG...such an impression on a young impressionable mind...such wondrously masterful artistic legerdemain..Marvel at it's finest...!